I’ve lost count of the amount of times I’ve said something like, ‘I’d like to go vegan one day’ over the past year. And with Veganuary upon us, now seems like the perfect time to finally give it a try. Veganuary is a charity which encourages people to try a vegan diet throughout the month of January (or at any other point during the year, if that suits you better). This means I won’t be eating any meat, fish, eggs, honey or dairy products from 1st-31st January 2018. Veganuary provide information about the vegan lifestyle on their website, including a starter kit. At the beginning of 2017 I had only just stopped eating fish to become a full-fledged vegetarian, so the timing wasn’t right. From the beginning, I’ve been adamant that I’ll make changes at my own pace, and a gradual switch works better for me than giving everything up at once. But at this point, my meals are vegan a good 80-90% of the time. I want to see if I can eat a completely vegan diet. Why am I doing Veganuary? I’d like to reduce the amount of animal products I consume. I want to kick the dairy habit for good. I’m interested to see if I can actually stick to it for the whole month. At one time, the reaction of other people would have bothered me, but not now. One of my bosses is a vegan, so work should be fairly straightforward (there’s always hummus in the fridge for a start). My family and friends, although apprehensive at first, have got used to my vegetarianism. And my once-skeptical housemates have enjoyed all the veggie dishes I’ve cooked so far. I’m keeping my fingers crossed that I won’t have to deal with too many unoriginal comments about vegans only eating grass, or plants having feelings. My biggest obstacle is going to be emotional eating. If I had to sit in the Mean Girls cafeteria, I’d be at the table with the Girls Who Eat Their Feelings. In times of stress, I turn to comfort food, and my favourite comfort foods (pasta, pizza, mozzarella sticks) normally contain a considerable amount of cheese. As much as I believe in indulging your cravings when you need to, I’d like to find some vegan alternatives to these foods. I’m already trying to perfect my butternut squash mac ‘n’ cheese recipe, but let me know if you have any suggestions — aside from the obvious, there are very few foods I don’t like. I’m aiming to post updates every Wednesday, but any kind of blogging schedule has fallen out the window since I started my current job, so don’t hold me to that! I’ll do my best. 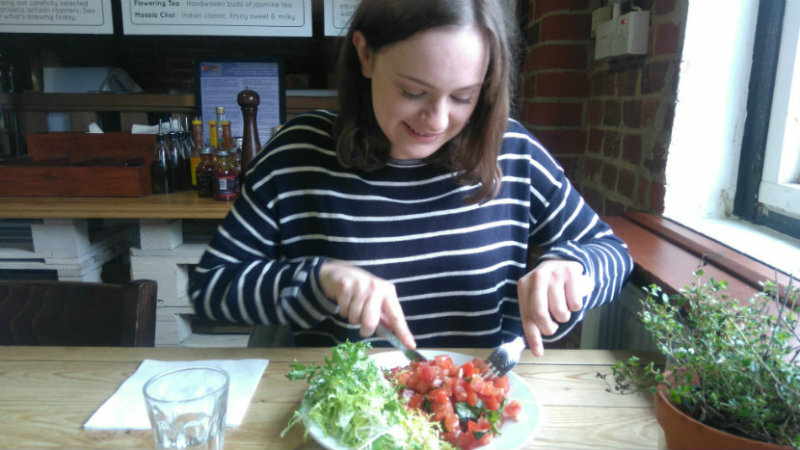 Have you ever taken part in Veganuary? Is it something you would consider trying? Let me know in the comments. Want to sign up for Veganuary? Click here.